If you want to tell a tall tale to your kids: "Wind chimes? They're made from the metallic bones of robots that tried to overthrow us. We hang them outside as a warning to the other robots." Which letter is silent in the word 'scent'? The 's' or the 'c'? The first time in history that a woman gave birth to twins, there were probably a lot of questions. It's possible that whoever created the tradition of the groom not seeing the bride in her dress until the wedding was just sparing men from having to go wedding dress shopping. Trump supports equal voting rights. He doesn't want anyone to vote. It's pretty common knowledge that "Canada" likely comes from the Huron-Iroquois word "kanata," which really means "village" or "settlement." Do you know where other provinces got their names? The names are evenly split between English words / names and names that come from Native languages like Cree or Ojibway. Newfoundland and Labrador — "New Found Land and One Who Tilled the Ground". The "new found land" aspect is pretty self-explanatory, as Newfoundland was among the first lands encountered by Europeans in the Americas back in 1497. The Labrador part wasn't made official until 2001, but the name dates back as far as 1500. The thought is that the land was named after Azorean explorer "El Ilavorador," and then anglicized. Prince Edward Island — "Land of Prince Edward, Son of King George III". The Mi'kmaw who inhabited Eastern Canada long before any settlers arrived called the island "Abeqweit," which means "cradle in the waves." When the French arrived, they began to call it "Ile Saint-Jean." Once the Treaty of Paris ceded the land to the British in 1763, it was renamed again as St. John's Island. Finally, in 1799, the British officially renamed the province after Prince Edward, Duke of Kent. New Brunswick — "Land of King George, Duke of Brunswick". Originally considered part of Nova Scotia, New Brunswick didn't become its own province until 1784. The name came as an honour to King George II, who was also the Duke of Brunswick, an area in Germany at the time. Quebec — "Narrow Passage". From the Algonquin word for "narrow passage" or "strait," the word "quebec" was used to describe the narrowing of the St. Lawrence River near what is now Quebec City. Since Quebec City was one of the first settlements within Canada, the province has gone through the most name changes. It was known as the OG Canada to New France as well as Lower Canada and Canada East before finally taking its provincial name. Yukon — "Great River". The Government of Canada explains that the territory's name likely sprung from the word "yu-kun-ah," which means "great river," though they don't specify if this word is Gwich'in in origin or from another First Nations language. Not officially named until the Yukon Act in 2003, the territory has been called Yukon Territory since 1898 but was likely referred to as Yukon as far back as 1846 when John Bell of the HBC travelled by canoe down the Porcupine River until it met the Yukon river, where natives of land referred to the big river as "youcon." Northwest Territories — "North-Western Territories". This territory has always been named as a simple description of its location. Not terribly exciting, unfortunately. The typographical changes happened in 1870, changing "North-Western" to simply "Northwest." Nunavut — "Our Land". This one is definitely more interesting. Nunavut became Canada's third official territory when it separated from the Northwest Territories in 1999. Given the opportunity to name their province, the Inuit people chose to call their province, "Nunavut," meaning "our land" in Inuktitut. Ontario — "Sparkling Water". From the word, "kanadario," which means "sparkling" water in Iroquois. The earliest record of the word Ontario is from 1641, when it described land northeast of the Great Lakes. The British originally were calling land in the U.S. "Quebec" and alternatively calling Quebec, as we know it, "Ontario." Only after the Consitutional Act in 1791 did Ontario become the land upstream from the St. Lawrence (Upper Canada), and Quebec became the land downstream from the St. Lawrence (Lower Canada). Finally, in 1867, Ontario and Quebec became their own provinces..
Manitoba — "The Narrows of the Great Spirit". The name is believed to originate from the Cree phrase, "Man-into-wahpaow" or "the narrows of the Great Spirit," referring to Lake Manitoba, which narrows at the centre. After entering confederation in 1870, Sir John A. Macdonald announced the province's name, which was suggested by Louis Riel, famous Canadian Metis. The name was meant to evoke the original inhabitants of the area. Saskatchewan — "Swift Flowing River". Fun to say and fun to spell, Saskatchewan was named after its river, called "Kisiskatchewanisipi," which means "swift flowing" river in Cree. The spelling was modernized in 1882 when Saskatchewan became a district of the "North Western" Territories. It became its own province in 1905. Alberta — "Land of Princess Louise Caroline Alberta". These last two are pretty straightforward, likely due to their overwhelming British-ness. Alberta was named after Queen Victoria's fourth daughter, Princess Louise Caroline Alberta. Also established as a district of the NWT in 1882, Alberta became its own province in 1905. British Columbia — "River of Columbia". Named after the Columbia River, the southern part of the province was known as simply "Columbia," while the central part of the region was called "New Caledonia." by explorer Simon Fraser. However, when the area became a colony in 1858, Queen Victoria renamed the areas British Columbia to avoid confusion with Colombia in South America and New Caledonia in the Pacific Ocean. 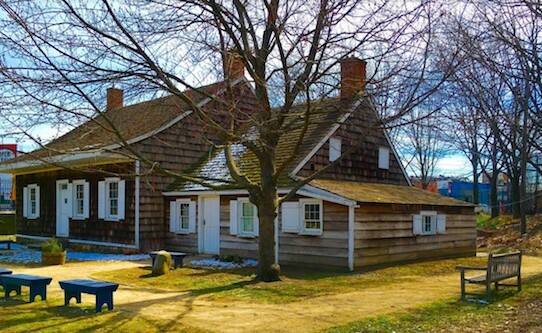 One part of the Wyckoff House in East Flatbush, New York City was supposedly built in 1652 (pictured). New Zealand is banning semi-automatic, assault rifles after the mosque shootings. Vancouver was the last major city on the continent to switch from driving on the left to the right side of the road, in 1922, but Newfoundland continued to drive on the left until 1947. Pennsylvania was the first North American jurisdiction to officially switch to right hand driving in 1792. California's economy is as big as France's. It's called 'four wheeled drive' people. Not 'four wheeled stop'. Watch your stopping distance in winter. 1000000000000066600000000000001 is called Belphegor's prime number. Belphegor is one of the 7 demon princes of hell. February 22nd 2022 falls on a Tuesday. So we will be able to call 2/22/22 2's day. If you replace the 'w' with 't' in 'what, where, and when? ', you get the answer to those questions. A few people think that a carbon tax is a horrible idea. It's just another tax for the government to get more spending money for their programs. The conservative politicians in this country would surely want you to believe this. "There are better ways to reduce carbon emissions than a carbon tax", they say. Except that this isn't true. For starters, before carbon taxes came to be, powers left to their own devices did not do much to reduce emissions. Why? Because there was no incentive to do so. If there is no ramification for emitting, then I'll likely emit as much as I want. Then, it turns out that a carbon tax is the most effective way to encourage emission reductions. But don't take my word for it. The economists who came up with the idea (William Nordhaus and Paul Romer) won a Nobel Prize for it. Many CEOs of oil companies have stated publicly that they support the idea of a carbon tax, because there's really no fairer way to encourage emission reduction. But I did title this article 'what's wrong with the carbon tax'. And what is wrong is the government's inability to sell it. The pundits would have you believe that a carbon tax is the biggest financial assault on the consumer since GST. What they don't tell you is that the tax is designed to be revenue neutral. Consumers are predicted to get more money back from a climate action incentive (in SK, MB, ON and NB) than they paid in carbon tax. Industry knows it can do better, but because up until now they didn't have to, they mostly didn't. The carbon tax forces them to consider the following. Which costs me more, emitting as per usual and paying the tax? Or cleaning up my act and paying much less tax? Nobody is forced to do anything (unlike when legislation is passed), but if you pollute, you pay. Sooner or later, it makes sense to pollute less. When the CEOs of Cenovus, Shell and Suncor say this is a good idea, it's harder to argue the point. Unfortunately, this rarely makes the front page (or the conservative election platform). Another thing that’s somewhat bad about the carbon tax is how all the provinces aren’t playing along with it. Ontario, Saskatchewan, Manitoba, and New Brunswick are not playing along. Yet they will end up paying a carbon tax directly or indirectly in a manner that should net them more money, but directly to the consumer. Not every province is adopting a carbon tax per se, but rather a cap and trade system, as is the case in Quebec. How the two options work gets complicated, which of course doesn’t help sell the idea. On the consumer side, we have much less choice in how we emit. If you heat your home with gas or oil, how are you supposed to burn less and still have a comfortable home? 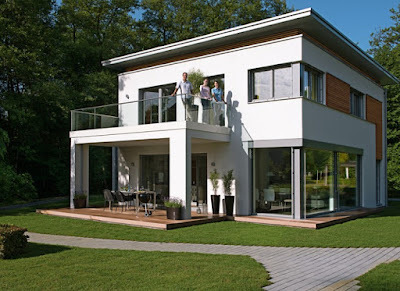 The only way is to either buy a greener home or retrofit your existing one. Both of those scenarios cost the kind of money that ordinary people don't usually have. The same thing goes for our vehicles. I could buy a $70,000 Tesla, but who has $70,000 for a new car? I don't. ·If you buy a purely electric car, you should either get a big rebate, a percentage paid of your car loan, or the part of your electric bill that provided the car’s power paid for by the carbon tax. ·If you buy a net zero energy or passive house, you should get the cost differential reimbursed by the carbon tax. If you retrofit your own home and make it net zero or passive house, you should get your money back, or at least a substantial part of it. In both cases you’re building homes that are not only better insulated and better constructed, they use less energy when it’s hot, and use so little energy to heat the home, many don’t even need a furnace - even in Canada. They also tend to last longer. That’s a game changer. ·High efficiency hot water heaters, furnaces, heat pumps, etc. should not only be the only kind you can buy, they should be subsidized to encourage upgrades in existing homes. ·Upgrading a home to include solar water and/or electricity generation should be easy to achieve with the help of 3rd party providers who will buy and install the hardware, hook you up both ways to the grid to sell excess energy, and then cut you a cheque every month for a portion of the surplus energy you sell back to the grid. They get their cut and this is used to pay off the hardware over 20 years. This way there’s no financial outlay for the homeowner. This has already been proven to work in Ontario and elsewhere. ·Developers should be encouraged to build entire developments sharing sustainable energy and heating sources. It has already been proven that it costs much less to build massive solar structures, geothermal heat extraction, long-term underground solar heat storage, etc. for dozens of homes at once than it would to do it one home at a time. ·Farms should be encouraged to become energy (and water) self-sufficient. I’ve written about this before. A combination of thermal and electric solar, wind and geothermal generation, coupled with closed system hydroponic farming would allow us to grow longer, with less water and produce fruits and vegetables normally unheard of in Canada. ·A national network of electric vehicle chargers needs to be built to encourage electric vehicle adoption. "I hadn't really thought about it"
There are probably a lot of people who don't quite understand what Brexit's ramifications are. 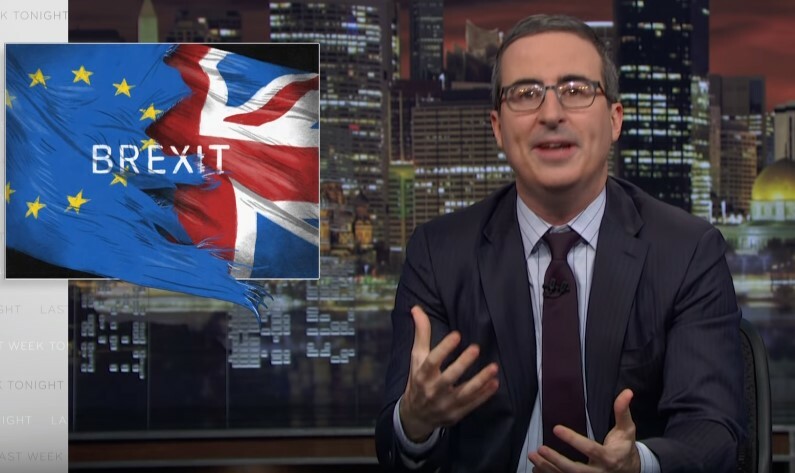 While I wouldn't normally suggest that people watch a comedian to get the gist of what's at stake, John Oliver does a bang up job. Caution: Language may be offensive to some. 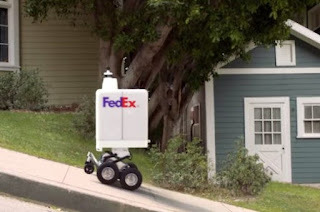 Fedex has developed a delivery robot on wheels to deliver items from a variety of stores to your door (pictured). 20 million more people visit the Dubai Mall than visit New York City in a year. 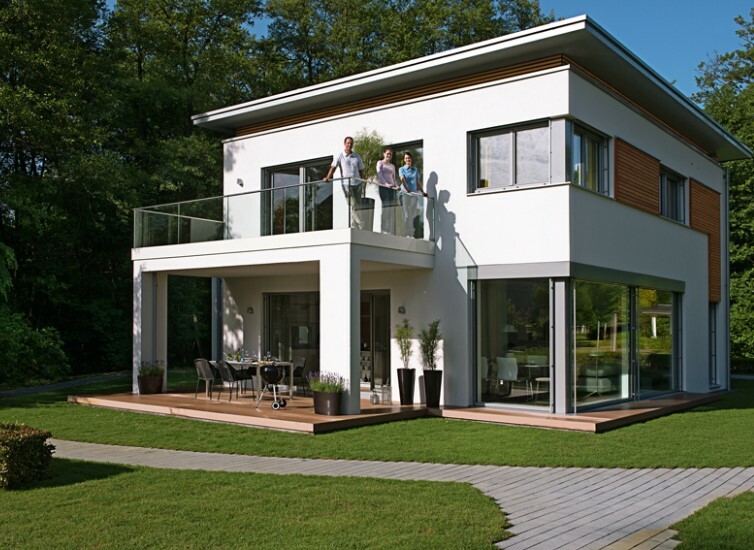 In Sweden, Allemansrätten gives a person the right to access, walk, cycle, ride, ski, and camp on any land, with the exception of private gardens, the immediate vicinity of a dwelling house (within 70m) and land under cultivation. There are similar rules in Finland, Norway, Iceland, Estonia, Belarus, Austria, Czech Republic and Switzerland. Moons can have moons and they're called moonmoons. At the bottom of ski jump hills are rows of fake green plants sticking out of the snow. They're there to help skiers with depth perception as they land their jumps. We don't all speak French. In Quebec & New Brunswick, there are a lot of people who only speak French and a lot of folks who are bilingual. But there are many places where people struggle to speak French, having only learned it in school and not had much chance to practice. Having said that, there are large pockets of French in communities all across Canada. These include Beaumont, Legal, Falher, Plamondon and Grande Prairie in Alberta. Take a look at towns around Winnipeg, especially south, and notice how many have French names. Fast food chain made poutine is nowhere near as good as the real thing. 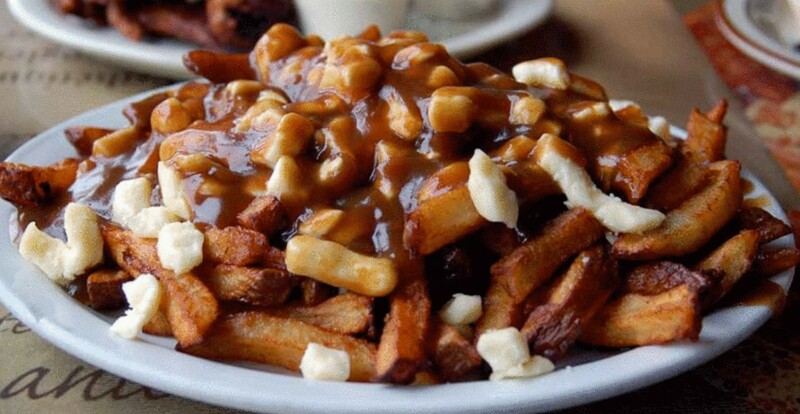 The fries have to be fresh cut, the curds have to be squeaky fresh and the gravy has to be of the viscosity suitable for an automatic transmission (pictured). Lacrosse is our official national sport, along with hockey. I challenge you to find 3 people in one random place in Canada who play lacrosse. Canadians love their maple leaf flag now. That wasn't so much the case when it was first unveiled. Canada has the longest coastline (243,977 km). There's only one French-speaking city larger than Montreal (Paris). Canada has a desert biome. It's in Osoyoos, BC. 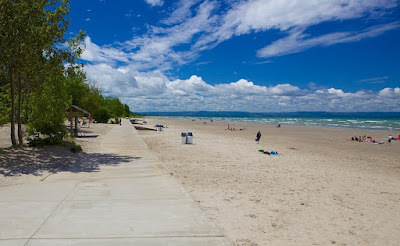 We have the longest fresh water beach (Wasaga Beach, in Ontario). The weather at the top of the country (Alert NU) is often warmer in winter than places like Ottawa or Edmonton. Canadian radio is legally obliged to play a high percentage (40%) of Canadian content. This was done to encourage radio play of artists who otherwise were only making it via US radio airplay. We invented the Wonderbra, alkaline battery, walkie-talkie and zipper. 20,000 year old tools have been unearthed in the Yukon. We have the most donut stores per capita. Santa Claus has an address in Canada. North Pole, Canada. The postal code is H0H 0H0. Westboro Baptist Church members are prohibited from entering Canada. It's only illegal to be a john, not a pro. The official phone number for Canada is 1-800-O-Canada. We eat more mac and cheese than anyone else. Baby walkers are illegal as they are deemed unsafe by the federal government. In Churchill Manitoba, you leave your vehicle unlocked so that people have an escape option if they encounter a polar bear (which is quite common). Canadian Air Force pilots often win in air-to-air combat contests against other countries. We have ketchup flavoured potato chips. Although we say 'sorry' a lot, apologies are legally inadmissible in court as an admission of guilt. You can find a couple of palm trees at Dundarave Beach in West Vancouver. Pelee Island, the southernmost point of Ontario (and Canada) is further south than Hartford Connecticut. It costs us less money for a flight to the southern US than across our own country. If you add all of the Pan-Asian ethnic groups together, they make up 44% of the population of Vancouver. Calgary averages 333 sunny days per year. Canada Dry ginger ale isn't actually made with much ginger at all. Halifax created a unique version of the original Gyro in 1973 that uses a sweet sauce instead of tzatziki and they call it a donair. In Quebec, since 1981, a woman has no legal obligation to change her last name when she gets married. Canada has a 2-tiered health system in certain respects. You can get an MRI within a week if you're willing to pony up $700-$1000. Much of Canadian milk is sold in plastic bags (but not out west). We make most of the maple syrup in the world. Mom: [typing] what does idk mean? Mom: See! Google doesn't know everything! 1 in every 3 people killed by a stranger in the United States is killed by a police officer. More than 24 states would consider ending the practise of time changes twice per year. It is likely that daylight savings time could become permanent. I, for one, am all for that. "I'd love to fly this marshmallow!" ~Col. 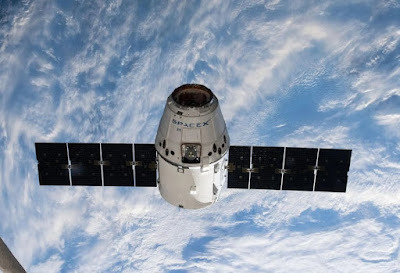 Chris Hadfield, Canadian astronaut, about the SpaceX Dragon capsule (pictured). It's a myth that to better sear or more evenly cook a steak, you should leave it out at room temperature. It's a myth that searing a steak first locks in its juices. It actually works better to slowly bring the meat to close to finished temperature, then sear to finish. It's a myth to only flip your steak once for best results. Multiple flips produces more even and faster cooking. The medals for the Tokyo Olympics will be made from recycled electronics. All dogs are therapy dogs. The majority of them are just freelancing. Robot poets would have it easy. Think about it. It's not that hard to rhyme in binary. You can't buy happiness. But you can buy ice cream and that's pretty close. It's so sad when people stereotype Australians by saying stuff like "Kids ride on the backs of kangaroos to school." Everyone knows that isn't true. They ride in the pouch. Getting a soaker on your socked foot is so trivial, and yet it feels so awful. "Thank you all very much for being here tonight and thank you for being part of a political revolution which will transform America. Thank you for being part of a campaign which is not only going to win the Democratic nomination, which is not only going to defeat Donald Trump, the most dangerous president in modern American history, but with your help is going to transform this country and, finally, create an economy and government which works for all Americans, and not just the one percent. Today, I want to welcome you to a campaign which says, loudly and clearly, that the underlying principles of our government will not be greed, kleptocracy, hatred and lies. It will not be racism, sexism, xenophobia, homophobia and religious bigotry. All of that is going to end. The principles of our government will be based on justice: economic justice, social justice, racial justice and environmental justice. Tonight, I want to welcome you to a campaign which tells the powerful special interests who control so much of our economic and political life that we will no longer tolerate the greed of Wall Street, corporate America and the billionaire class - greed which has resulted in this country having more income and wealth inequality than any other major country on earth. No. We will no longer stand idly by and allow 3 people in this country to own more wealth than the bottom half of America while, at the same time, nearly 20 percent of our children live in poverty, veterans sleep out on the streets and seniors cannot afford their prescription drugs. We will no longer accept 46 percent of all new income going to the top 1 percent, while millions of Americans are forced to work 2 or 3 jobs just to survive and over half of our people live paycheck to paycheck, frightened to death about what happens to them financially if their car breaks down or their child becomes sick. Together, we are going to create a political system which is based on the democratic principles of one person - one vote - and end a corrupt system which allows billionaires to buy elections. Yes. We are going to overturn Citizens United and move to public funding of elections. Today, we fight for a political revolution. And tonight, I want to offer a very special thanks to the people of the great state of Iowa. In 2016, this is where the political revolution began. Thank you Iowa. When I first came here to campaign in 2015 not a whole lot of people knew who I was, nobody took our campaign seriously, and we were at 3 percent in the polls. Further, the ideas that we were talking about then were considered by establishment politicians and mainstream media to be "radical" and "extreme" - ideas, they said, that nobody in America would support. Raising the minimum wage to a living wage. Too radical. Guaranteeing health care to all as a right, not a privilege. Too radical. Creating up to 15 million jobs by rebuilding our crumbling infrastructure with a one trillion dollar investment. Too radical. Aggressively combatting climate change. Too radical. Reforming our broken criminal justice and immigration systems. Too radical. Not taking money from super PACs and the rich. Too radical. Ending the power of super delegates at the Democratic Convention. Too radical. Well, a funny thing happened in Iowa over that year. On Caucus Night we didn't win 3% of the vote, we won 50% of the vote and half of the pledged delegates. And, by the way. Those ideas that we talked about 4 years years ago that seemed so very radical at that time. Well, today, virtually all of those ideas are supported by a majority of the American people and have overwhelming support from Democrats and independents - and they're ideas that Democratic candidates for president to school board are now supporting. So Iowa, you helped begin the political revolution in 2016 and, with your help on this campaign, we are going to complete what we started here. We're going to turn our vision and our progressive agenda into reality. Today, as we launch our campaign here in Iowa, we say to the private health insurance companies, whether you like it or not, the United States will join every other major country on earth and guarantee healthcare to all people as a right. All Americans are entitled to go to the doctor when they're sick and not go bankrupt after staying in the hospital. We will no longer accept the absurdity of paying almost twice as much per capita on health care, while we have a lower life expectancy and worse health care outcomes than many other countries. The goal of health care must be to provide quality care to all in a cost effective way, not tens of billions in profits for the insurance companies and outrageous compensation packages for CEOs. In 2017, the top 65 healthcare CEO's made $1.7 billion in compensation including: $83.2 million to David Wichmann, the CEO of UnitedHealth Group and 58.7 million to Mark Bertolini, the CEO of Aetna. We need a health care system that invests in disease prevention, doctors, nurses, dentists and rural clinics. We don't a system which makes insurance companies and their CEOs super rich. Yes. We will pass a Medicare for all single-payer program. Health care is a right. And, by the way, our legislation improves health care for seniors by providing coverage for dental care, hearing aids and eye glasses. Today, we say to the pharmaceutical industry, that you will no longer charge the American people the highest prices in the world for prescription drugs, the result being that one out of five Americans cannot afford the prescriptions their doctors prescribe. Seniors in this country should not have to cut their pills in half. The outrageous greed of the pharmaceutical industry is going to end. We are going to lower prescription drug prices in this country. Today, we say to Walmart, the fast food industry and other low wage employers: Stop paying your employees starvation wages.. Yes. We are going to raise the federal minimum wage to a living wage - $15 an hour. Nobody who works 40 hours a week in this country should live in poverty. And yes. We're going to make it easier for people to join unions, not harder. Four years ago, when we talked about the idea of a $15 an hour minimum wage, it seemed like an impossible dream. Well, since then, I'm happy to tell you that 5 states have passed $15 an hour legislation and, just yesterday, the U.S. House Committee on Labor and Education reported out a bill that will raise the federal minimum wage from $7.25 an hour to $15 an hour. And, I believe, that bill will pass the full House within the month. And by the way. Today we say to corporate America that artificial intelligence and robotics are not going to be used just to throw workers out on the street. This exploding technology must serve human needs, not just corporate profits. Today we say to the American people that we will rebuild our crumbling infrastructure: our roads, our bridges, our rail system and subways, our airports, our water systems and wastewater plants - and when we do that we create up to 13 million good paying jobs. And let's be clear. When I talk about infrastructure and clean water we're talking about strengthening clean water laws so that corporate polluters stop poisoning the drinking water that communities in Iowa and across the country rely on. Today, we say to our young people that we want you to get the best education that you can, regardless of the income of your family. Good jobs require a good education. That is why we are going to make public colleges and universities tuition free, and substantially lower the outrageous level of student debt that currently exists. America once had the best educated workforce in the world, and we are going to make that happen again. Today, we say to Donald Trump and the fossil fuel industry that climate change is not a hoax but is an existential threat to our country and the entire planet - and we intend to transform our energy system away from fossil fuel and into energy efficiency and sustainable energy and, in the process, create millions of good paying jobs. All of us have a moral responsibility to make certain that the planet we leave to our children and grandchildren is healthy and habitable. We will no longer accept the absurd situation where large corporations like Amazon, Netflix and General Motors pay nothing in federal income taxes after raking in billions in profits. We will no longer tolerate the situation in which the wealthy and large corporations stash billions in tax havens throughout the world. Yes, the wealthy and multi-national corporations in this country will start paying their fair share of taxes. We are going to end austerity for working families, and provide some austerity for large, multi-national corporations. Today, we say to the military-industrial-complex that we will not continue to spend $700 billion a year on the military - more than the next ten nations combined. We're going to invest in affordable housing, we're going to invest in public education, we're going to invest in rebuilding our crumbling infrastructure - not more nuclear weapons and never-ending wars. Brothers and sisters: We're going to win this election not because we have a super PAC funded by billionaires. We're going to win this election because we will put together the strongest grassroots coalition in the history of American politics. Donald Trump wants to divide us up by the color of our skin, our country of origin, our gender, our religion and our sexual orientation. We are going to do exactly the opposite. We are going to bring our people together - black, white, Latino, Native American, Asian American, gay and straight, young and old, men and women, native born and immigrant. We are going to bring our people together for an unprecedented grassroots effort, which, I am happy to tell you, already has over one million people signed up as volunteers. Brothers and sisters: As someone who represents Vermont, one of the most rural states in the country, let me be very honest with you in saying that the U.S. Congress has, for too long, ignored the many crises facing rural America. In Iowa, in Vermont and all over this country, we have seen more and more young people leave the small towns they grew up in and love, not because they don't want to stay, but because there are fewer and fewer jobs that pay a living wage. We have seen schools, churches and community centers shut down, and once vibrant Main Streets become boarded up and deserted. In Vermont, Iowa and all across rural America, we have seen family farmers go out of business as the prices they receive for their products decline rapidly and large agri-business corporations and factory farming take over agriculture. We have seen rural hospitals and nursing homes shut down, and not enough doctors to provide the quality health care that rural American deserves. Tragically, instead of seeing good jobs, education and health care coming into our rural communities, we are far too often seeing despair and depression - and a terrible increase in suicide and opioid addiction. Brothers and sisters. We need policies for rural America that represent the needs of working people and farmers, not agri-business and multi-national corporations. Among many other things that need to be done is for the federal government to enforce anti-trust laws, and I will appoint an Attorney General who will do just that. It is not acceptable to me that the top four packing companies control more than 80 percent of the beef market, 63 percent of the pork market, and 53 percent of the chicken market. And these numbers understate the situation. In many communities, there really is only one buyer, which means food producers are at their mercy. They must use that corporation's feed and livestock, they must accept that corporation's costs, and they must accept that corporation's lower and lower payment rates. In many cases, the farmer doesn't even own the livestock or supplies -- they are effectively contract employees who are forced to lease everything, and then get paid an inadequate wage for their very hard work. With the federal government not enforcing antitrust laws, we have seen mergers like the Bayer-Monsanto approved, giving the two largest conglomerates 78 percent of the corn seed market. Further, instead of protecting family owned farms, federal support for agriculture is skewed toward huge farms. The top 10 percent of farms currently receive 77 percent of all subsidies. The time is long overdue for the U.S. government to stand with rural America, and that is exactly what I do. Brothers and sisters. Over the last two years, and before, you and I and millions of Americans have stood up and fought for justice in every part of our society. And we've had some successes. Together, as billionaires and large corporations have attacked unions, destroyed pensions, deregulated the banks, and slashed wages, we have succeeded in raising the minimum wage to $15 in states and cities across the country. And forced large corporations like Amazon and Disney to do the same. And we have supported teachers who successfully stood up for their kids in strike after strike after strike. Together, as the forces of militarism have kept us engaged in unending wars, we have stood arm-in-arm to fight back. For the first time in 45 years, we have utilized the War Powers Act to move us forward in ending the horrific Saudi-led war in Yemen. Together, as so many of our young people have received criminal records for nonviolent offenses, we have fought to end the war on drugs, and have seen state after state decriminalize marijuana, and have seen communities expunge the criminal records of those arrested on these charges. Let's be honest: while we have won some victories, our struggles have not always been successful. But I am here to tell you, that because of all the work we have done, we are now on the brink of winning not just an election, but transforming our country. And let me tell you what that means. When We are in the White House, we will enact a federal jobs guarantee, to ensure that everyone is guaranteed a stable job. There is more than enough work to be done in this country. Let's do it. When We are in the White House we will not only end the decline of rural America, but attack the problem of urban gentrification and build the affordable housing we desperately need all across this country. When We are in the White House, we will move aggressively to end the epidemic of gun violence in this country and pass the common sense gun safety legislation that the overwhelming majority of Americans want. People who should not have guns, will not have guns. When We are in the White House, we are going to address not only the disparities of wealth and income that exist overall in our nation, but we will address the racial disparities of wealth and income. We are going to root out institutional racism wherever it exists. Not only will we end voter suppression, we are going to make it easier for people to vote - not harder. When We are in the White House, we are going to protect a woman's right to control her own body. That is her decision, not the government's. Make no mistake about it, this struggle is not just about defeating Donald Trump. This struggle is about taking on the incredibly powerful institutions that control the economic and political life of this country. And I'm talking about Wall Street, the insurance companies, the drug companies, the military-industrial complex, agri-business, the prison-industrial complex, the fossil fuel industry and a corrupt campaign finance system that enables billionaires to buy elections. These powerful special interests are going to spend a lot of money to try to defeat us. But we have something they don't have: the power of the people. If we stand together, this country has an extraordinary future. Let's make it happen." This would be fun just to get to hear Trump yell "We need to see this guy's birth certificate!" There is a store in Amsterdam that specializes in rubber ducks. The Onomichi City Art Museum in Hiroshima prefecture, Japan, has an ongoing battle with unwelcome visitors. Two of them, to be exact. They are Ken Chan and Gosaku and they are cats. The two cats have spent years trying to visit the museum, but are constantly thwarted by the security guard and other museum staff trying to enforce the museum's "no animals" policy. The standoff may have started off as a mere desire to see what's inside, but over time, both sides see the entry of the cats as a challenge. This is what happens when you tell a cat they can't do something. Michael Jackson, the late King of Pop, actually wanted to play Spiderman in the movies. From September 2017 to September 2018, Facebook identified and removed 2.8 billion fake accounts. The metre was originally defined in 1793 as 1/10,000,000 the distance from the equator to the North Pole (passing through Paris). Virtually the entire continent of South America is EAST of Florida (pictured). Paris is further north than Montreal. Most of Africa is NORTH of the equator. Brazil is bigger than the contiguous United States. Deaf people sometimes don't realize that hearing people can hear farts. This guy died after a bale of marijuana fell on him. Blunt force trauma. What is this 'normal' that you speak of? You are the universe expressing itself as a human. For a little while. FYI Americans, when we say it, the word "about" sounds way more like "a boat" (with a Brit accent) than "a boot". I'm still impressed with what Mercedes Benz has been able to coax out of their turbocharged engines. I love my B250, but it's missing some things a higher end model would solve. Heated steering wheel (becoming a must now), power tailgate, heads up display, semi-autonomous cruise control. Mercedes is also a front runner when it comes to the evolution of autonomous driving, so I'd be in good hands. So I'd consider a GLC 300. 241 hp and 273 lb-ft of torque? Out of a 4 cylinder? Yeah, that would probably do. And it has all the things I mention above. All the things!! For added fun, but also the added annoyance of having much higher gas bills and probably bruises on the arm facing my darling wife (from punches), I'd give the GLC 63 S 4Matic+ a try for sheer lunacy. Hello bi-turbo V8 with 503 hp and 516 lb-ft of torque. Like I said, sheer lunacy. But fun. I'd be sneaking up on everyone in ECO mode and then just before the light turns green I'd quickly switch to Sport+ mode and let the exhaust growl and pop. All the things plus noises!! I'm such a guy. I am tremendously excited about the evolution of all-electric cars. Tesla forced everyone to change their game and came out with some great cars in the process. But the Model S and X are just way too big for me. The Model 3 is quite nice, but I have my hopes pinned on the still to be released Model Y. A scaled down Model X is just what the world needs, is more practical, and will have even more tech goodies that the Model 3 has now and maybe more. Plus, Tesla has a habit of future-proofing their cars by upgrading features and capabilities through software, with the necessary hardware already installed. That's smart. But Tesla is no longer the only electric game in town. I am very curious what the new Mercedes EQC will be like. Could Mercedes beat Tesla to market with a modest SUV before the Model Y is released? Watch this space. Volkswagen is busy readying their lineup of electric cars too. But the one that looks the absolute coolest of them all, maybe even cooler than Tesla, is the new ID Buzz, the latest incarnation of the old vee-dub microbus. Now, you're probably thinking, "Would you really be happy in an electric vehicle considering that you just said you'd like to own a 503+ hp Mercedes?" Yeah, I think I would. These electric vehicles, especially the Teslas, have insane instant torque and that's all the fun really. It's not the steady speed most people are interested in, it's the acceleration. The key will be charging options. Here, Tesla has an edge due to their global 'supercharger' network of chargers. I know I'd be able to drive a Tesla Canada-wide and to my favourite US destination (San Diego) and always be in range of a supercharger. Plus my destination hotel of choice there has a Tesla charger right in the garage. Tim Hortons plans to introduce a double-double coffee snack bar this fall. It will contain caffeine but no chocolate. If you are Canadian (or American), your heritage is either indigenous, refugee or immigrant. That's it. In the UK's NHS, not only is health care free, but most people get free prescriptions and dental work as well. Those who do have to pay are capped at around CAD$15 per prescription, and teeth cleaning is capped at around CAD$37. There are more Huawei smartphones in people's hands worldwide than iPhones. 90.5 % of the world's plastic waste does not get recycled. In the original Star Trek series, 55 of the 430 crew of the Enterprise died. 24 of them wore red shirts. It's not so much the altitude that prevents you from making a cell phone call while flying - it's the speed. It is possible for a cell tower signal to get up to 10,000 feet, although it's not reliable. But the hand-off process that hands a call off from one cell tower to another is only designed to track a phone doing less than 100 mph (160 km/h). The Gap Inc. also owns Banana Republic, Old Navy and Athleta.